This mission is a storyline , it should be classed as "important"
In Pocket 2 I first killed the BSs and while my Drones fought the smaller stuff I took out the Silo. It dropped: some charges, trade goods and 1 Caldari CU-1 Nexus Chip. The mission loot however was in the last enemy ship as reported. 20 Jan 2009 -- Pocket 1, Group A no longer insta agros, so you can quielty motor out to kiting/sniping range. Group B agros as soon as you attack Group A, so be prepared to kill their web/scrammers before the battleships get close enough to harm you. Raven still ok; even using T1 equipment such as XT-9000 cruise missile launchers with two kin and one therm active shield hardeners. 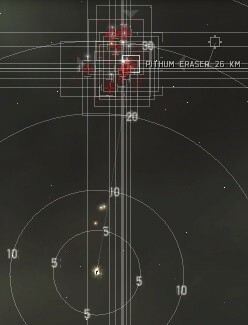 Silo dropped a Caldari AZ-1 Nexus Chip, 50 High-Tech Manufacturing Tools and some ammo. If Group A doesn't auto-aggro, you can engage Group B without A attacking you or your drones. "Drones can be deployed normally and do not cause pocket aggro." Pocket 1: Flew away from them in my T2 fitted Rokh. Read the guide (Very important) (normal/hard difficulty, if you follow the guide). Warning: Manage the gro at all times as they hit kinda hard even at distance. My drones got aggro from Grp A while I was engaged with grp B, so wait till after A+B has been detroyed/aggroed before drone deployment. I dont like Gueristas missions and this one also took some time. Had to refit Abaddon and install 2 additional HS II and drone link aug cause I had not enough firepower to kill destroyer in the first pocket. Lost 5x Hammerhead II, worth 2.5 million ISK. This one gives insane rewards. Yesterday it gave me a Mining Foreman Mindlink. this gave me an 8.4% standing increase, very nice mission, simple and easy if you follow instructions and avoid whole pocket agro. A aggroed a few seconds after warp in. Returning fire did not aggro B. B was destroyed next, then C, D, E.
The cruisers pop in seconds, just the BS are the usual lazers vs. gurista pain.. Some of the BS's in this mission will target jam you, FYI. I just waited it out; they rarely chain-jammed. Reward is useless to me, but sold for 12 million ISK. 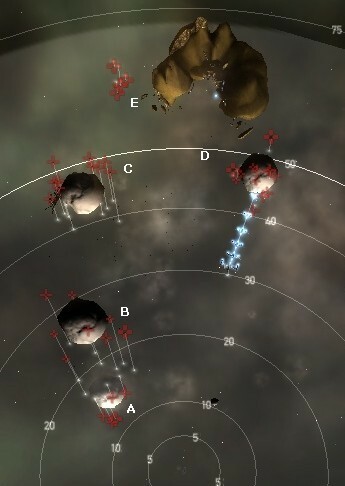 Groups in pocket 1 seem to be chained to their spawn locations, they don't move far from there. Should come in handy for everyone with long-range weapons. Drone aggro from the scrammers is dangerous. Recommend taking them out from a distance if need be.